The present volume aims at enhancing our understanding of the ambivalent, multidimensional process of identity formation in Britain during the Long Eighteenth Century. The collection is framed by the editors brief introduction and Dafydd Moores concluding Coda: The former calls into question the meanings of Britishness by exploring the discrete but interrelated literatures, cultures, and histories of England, Scotland, Ireland, and Wales and aims at the de-naturalization of the nation-state as a category for ordering and interpreting literary history. 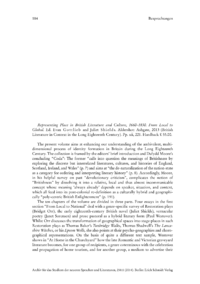 Accordingly, Moore, in his helpful survey on past devolutionary criticism, complicates the notion of British ness by dissolving it into a relative, local and thus almost incommunicable concept whose meaning always already depends on speaker, situation, and context, which all feed into its post-colonial re-definition as a culturally hybrid and geographically poly-centric British Enlightenment.